The FM-11 AD2 is an evolution of the FM-11 AD. It is delivered with the OS-9 operating system. There was also a FM-11 AD2+ model with enhanced features like 256 KB RAM instead of 128 KB. Looks like the FM11 AD2 had an HD63C09EP from Hitachi installed. It was a PIN/Code compatible CMOS/3MHz version of the MC68B09E from Motorola. For licensing reasons Hitachi kept as a "secret" that it has a special native mode with additional instructions/registers/capabilities and more speed. I don't think these features were used in the stock OS-9 Level II installed. With our CoCo3s and the CPU changed to an HD63C09EP we use a special OS-9 version called NitrOS9 to take advantage of this native mode. I've owned FM-11AD2, used for 3 years. Here I wanna introduce unique aspect of this wonderful machine. 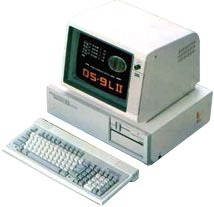 FM-11BS might be only model come with 8088. After ST/AD/EX line-up, AD2 and BS replaced, then AD2+ followed. OS-9 was packaged with AD2/AD2+. AD2+ is supposed to be the longest one which FUJITSU manufactured because amazing multitask was appropriate for many industrial devices. When I was noticed from final lots of FM-11AD2+ from FUJITSU, over 2 following generation FM series were extinct. KEYBOARD Complete professional keyboard with function keys and separated numeric keypad (JIS standard). 98 keys. see more Fujitsu FM 11 AD 2 Ebay auctions !